Earlier this week, GSOC issued a scathing report into the deficiencies in the investigation of the death of Fr. Niall Molloy, which occurred in 1985. In 2015, the Fine Gael-Labour Party Government backed the DPP decision not to have a new inquiry into his death. Some 33 years on, his family and many people in County Roscommon are not happy. The programme for Government talks about a fair society for all. In light of the GSOC report, which was released on Monday, I have two questions and I do not mind if the Taoiseach or the Minister for Justice and Equality answers. Can they inform the House if an investigation is ongoing into the death of Fr. Niall Molloy? Due to the seriousness of the information in the report that documents have gone missing, what does the Government intend to do now in relation to this case? I assure the House, and the Deputy in particular, that there still is an ongoing Garda investigation into what is an open file. In the event that Deputy Murphy or any of his constituents have any information that might assist the gardaí in processing the issue further, I trust that the information will be forthcoming. I acknowledge the independent review undertaken by Dominic McGinn SC in recent times. As it is independent of Government, I do not have any grounds at this stage to take matters any further. It is the subject of a live and active Garda investigation. Fine Gael Chairman Charlie Flanagan has said that there must be no delay in the handling of the Fr Nially Molloy file by the office of the DPP after a Garda file on the case was submitted to the office by the Serious Crime Review Unit. To ask the Minister for Justice and Equality further to Parliamentary Question No 8 of 20 June 2012, if the Garda Commissioner has received the final report from the gardaí carrying out the examination; if he has received an update from the Commissioner; if he has received a final report on the examination from the Commissioner, and if not, when he expects to receive this report; and if he will make a statement on the matter. I am informed by the Garda authorities that the review of the case in question is not yet finalised and that a number of matters remain outstanding. I expect to receive an update from the Garda Commissioner when these are finalised. As I indicated in my reply to the Deputy’s question on 20 June, I am very aware of the concerns which have been expressed about this case, but feel it is important in the first instance that we allow the present Garda examination to proceed to a conclusion. Upon receipt of Commissioner’s report I will then review the situation. for ORAL on Wednesday, 24th October, 2012. To ask the Minister for Justice and Equality further to Parliamentary Question No. 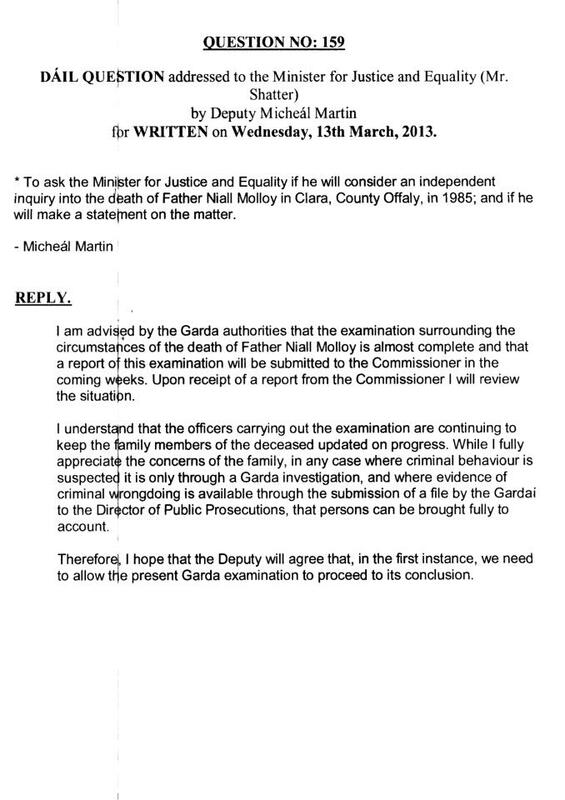 8 of 20 June 2012, the position regarding the Garda review into the murder of Fr. Niall Molloy in Clara, County Offaly, in July 1985; if he will accede to the request by the family of an independent inquiry into the priest’s death; and if he will make a statement on the matter. I am advised by the Garda authorities that the examination referred to by the Deputy is ongoing. The Commissioner has assured me that each and every line of inquiry is being or will be pursued. Upon receipt of a final report from the Commissioner I will review the situation. I understand that the officers carrying out the examination are continuing to keep the family members of the deceased updated on progress. While I fully appreciate the concerns of the family, in any case where criminal behaviour is suspected it is only through a Garda investigation, and where evidence of criminal wrongdoing is available through the submission of a file by the Gardaí to the Director of Public Prosecutions, that persons can be brought fully to account. I therefore hope the Deputy will agree that, in the first instance, we need to allow the present Garda examination to proceed to its conclusion. 29/01/2013 Minister for Justice and Equality (Deputy Alan Shatter): I propose to take Questions Nos. 557, 574 and 575 together. I am advised by the Garda authorities that the examination surrounding the circumstances of the death of Father Niall Molloy is ongoing. The Commissioner has assured me that each and every line of inquiry is being or will be pursued. Upon receipt of a final report from the Com- missioner I will review the situation. I understand that the officers carrying out the examina- tion are continuing to keep the family members of the deceased updated on progress. While I fully appreciate the concerns of the family, in any case where criminal behaviour is suspected it is only through a Garda investigation, and where evidence of criminal wrongdoing is avail- able through the submission of a file by the Gardaí to the Director of Public Prosecutions, that persons can be brought fully to account. Therefore, I hope that the Deputies will agree that, in the first instance, we need to allow the present Garda examination to proceed to its conclusion. forORAL ANSWER on Wednesday, 6th March, 2013. * 194. To ask the Minister for Justice and Equality if there will be an independent inquiry into the death of Fr. Niall Molloy in Clara, County Offaly..
22. To ask the Minister for Justice and Equality further to Parliamentary Question No. 8 of 20 June 2012, the current status of the Garda review of the murder of Fr. Niall Molloy in Clara, County Offaly, in July 1985; if he will accede to the request by the family for an independent inquiry into the priest’s violent death; and if he will make a statement on the matter. I am advised by the Garda authorities that the examination surrounding the circumstances of the death of Father Niall Molloy is almost complete and that a report of this examination will be submitted to the Commissioner in the coming weeks. Upon receipt of a report from the Commissioner I will review the situation. I understand that the officers carrying out the examination are continuing to keep the family members of the deceased updated on progress. While I fully appreciate the concerns of the family, in any case where criminal behaviour is suspected it is only through a Garda investigation, and where evidence of criminal wrongdoing is available through the submission of a file by the Gardaí to the Director of Public Prosecutions, that persons can be brought fully to account. Therefore, I hope that the Deputy will agree that, in the first instance, we need to allow the present Garda examination to proceed to its conclusion. for WRITTEN on Tuesday, 30th April, 2013. * To ask the Minister for Justice and Equality if he has already received, or if not, if he will request as a matter of urgency the report of the formal review by the Garda Serious Crime Review team in to a murder enquiry (details supplied) in 1985 in County Offaly; and if he will make a statement on the matter. REPLY.I am advised by the Garda authorities that the examination surrounding the circumstances of the death of Father Niall Molloy is almost complete and that a report of this examination is expected to be submitted to the Commissioner sometime in May. Upon receipt of a report from the Commissioner I will review the situation. I am advised by the Garda authorities that the examination surrounding the circumstances of the death of Fr. Niall Molloy is almost complete and that a report of this examination is expected to be submitted to the Garda Commissioner some time this month. Upon receipt of a report from the Commissioner, I will review the situation. I understand that the officers carrying out the examination are continuing to keep the family members of the deceased updated on progress. While I fully appreciate the concerns of the family, in any case where criminal behaviour is suspected, it is only through a Garda investigation and where evidence of criminal wrongdoing is available through the submission of a file by the Garda to the Director of Public Prosecutions that persons can be brought fully to account. Therefore, I hope the Deputy will agree that, in the first instance, we need to allow the present Garda examination to proceed to its conclusion, which, I reiterate, I understand is almost complete. I understand it will result in a report being furnished to the Garda Commissioner this month, and I then expect the Garda Commissioner to report to me. We will await the outcome of that report. The Minister will be very familiar with this case going back to the time when he was an Opposition spokesperson on justice. I have had a chance to review what is known about the case, most of which is in the public domain. Potentially it is one of the biggest scandals in the history of the State in terms of the range of people associated with it, including people in medicine, the Judiciary, policing and politics. Like the Deputy, I am very familiar with the case. I am familiar with all the allegations made. I was familiar with it when I came into office. Shortly after assuming my position as Minister, I requested that these allegations be investigated. The Garda Síochána was the appropriate body to conduct the investigation should evidence emerge that would justify the taking of any criminal prosecution. It has taken a substantial amount of time for this investigation to be concluded. In 2011, I did not anticipate that it would take until May 2013 to conclude it. I understand it is on the verge of being concluded. I have been assured the Garda Commissioner will receive a report this month. I hope the Deputy will understand if I, as Minister, do not in any way comment on what he has said about the matter because it is very important I do not prejudge the outcome of the investigation, that I say nothing that might prejudice any matters arising from it. At present, I am not privy to the outcome of the investigation and do not know what conclusions have been reached. I am very conscious that the tragic death of Fr. Molloy took place very many years ago. Clearly, in investigating his death, there are certain evidential issues that may be a cause of difficulty, but I have no reason to make any presumption one way or another about that. I find it strange my Question No. 41, which deals with the same issue, was not grouped with this. The family was told on 11 March the report was with the Garda Commissioner. On Tuesday, the Minister told the House, through a reply to a question from Deputy Charles Flanagan, that it will be submitted some time this month, and the Minister has stated this again today. Who is wrong? Is it the Minister or the officer who is supposed to be briefing the family and explaining to them what is going on in this investigation? Does the Minister not find it bizarre that the original Garda file was stolen, the coroner’s file was destroyed, the State Laboratory’s file is not available and now we find the review file is lost somewhere between Harcourt Street and the Phoenix Park? It is not acceptable to the family that this review is an ongoing issue when the Minister told me in the House almost 12 months ago that it was nearly completed at that stage. Will the Minister assure the House it will be with the Garda Commissioner by the end of this month and that he will, soon after this, receive a report on it and, on foot of this, take appropriate action? The drama is clearly continuing with this and there is now so much controversy and unanswered questions that nothing short of a public inquiry will suffice. The information I have is that the head of the cold case unit, the person in charge of the investigation, briefed the family and stated the report the Minister said was not completed was completed at the end of February and given to the Garda Commissioner at the start of March. This is a fact. With regard to the Minister’s statement that the family is being consistently briefed by the Garda, the family state this is not the case and they have not been kept in the loop. This is a further vindication of my opinion that this tragic case and the cover-up around it requires a public inquiry. An independent public inquiry will probably be required to achieve any transparency and accountability in this episode. When the Minister was in opposition, did he at any stage call for an independent inquiry on this matter? I am concerned that the confines of this re-examination and report will be limited to the immediate investigation. As the Minister knows, a range of issues flow from this case which are of the utmost concern. This case is truly shocking. I had a chance to review it in detail over the weekend and I am stunned at the extent of the scandal. The public will not be satisfied with police investigating police, looking only at the initial investigation and not at all the issues which have flowed from it in the decades since, which would be of massive public concern. The State must be held to account and there needs to be an independent public inquiry, not just of the initial death and investigation but of all the issues which have flowed from it in the decades since. I will begin by telling Deputy Naughten I am not interested in political points scoring. I am providing the information available to me from my officials. The information is that the Garda Commissioner will have the report during this month. I assume that, as I have requested, the Commissioner will report to me. It is an issue I have regularly made inquiries about since being appointed Minister. I cannot interfere in a Garda investigation and I will not do so. It is important that operational issues are dealt with independently by An Garda Síochána. I will not draw conclusions. I am aware of all the allegations and I am aware of all the concerns. I have been for some time, which is why in 2011 I requested this matter be investigated. Deputy Daly has a habit of coming to the House and making all sorts of allegations. I will not respond. I can only say I have had this issue raised out of a genuine concern of what I know and what I have been told about the background to this matter. As I stated, I expect to receive the report. I will give very careful consideration to what is in it. I will then consider what action, if any, is appropriate arising out of the report. I do not know at this time whether the report might indicate some papers should be forwarded to the Director of Public Prosecutions. It may be that it will and it may be that it will not. I simply do not know the answer to this. If it does, this brings about certain consequences. I cannot be certain as to what will be said in the context of the report. I will deal with it when it comes to me. We will then see where we go from that point. It is an issue I treat with a great deal of seriousness and no one should be under any illusion about it. I never said you would. —–which could be contrary to the public interest. I have never believed in matters being covered up. I believe in transparency. I do believe where there is a suggestion of wrongful behaviour or a suggestion of criminality that these issues should be properly investigated. I will not prejudge allegations. It would be inappropriate of me to do so. DIL QUESTION addressed to the Minister for Justice and Equality (Mr.
for WRITTEN on Thursday, 9th May, 2013.
on 11 March in relation to the Fr. Niall Molloy case..
Commissioner I will review the situation. can be brought fully to account. conclusion, which, as I have indicated, will be shortly.